The ACE ESA 24V system Top Loading is equipped, at printing unit entrance and exit, of high performance londual BB bars with DC-Pulse 24V technology. 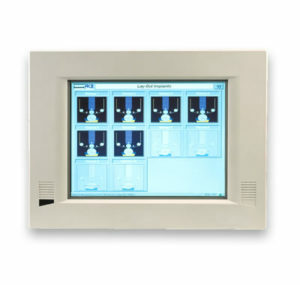 The antistatic bars equipping ACE ESA Systems in fact, have become a standard in Electrostatics Assistance to Rotogravure Printing with 24V configuration, which includes low-voltage cables and high voltage power supply integrated within the body of the bar itself. The new generation of antistatic londual BB 24V bars feature a double row of discharging needles and LEDs to show the operating status. 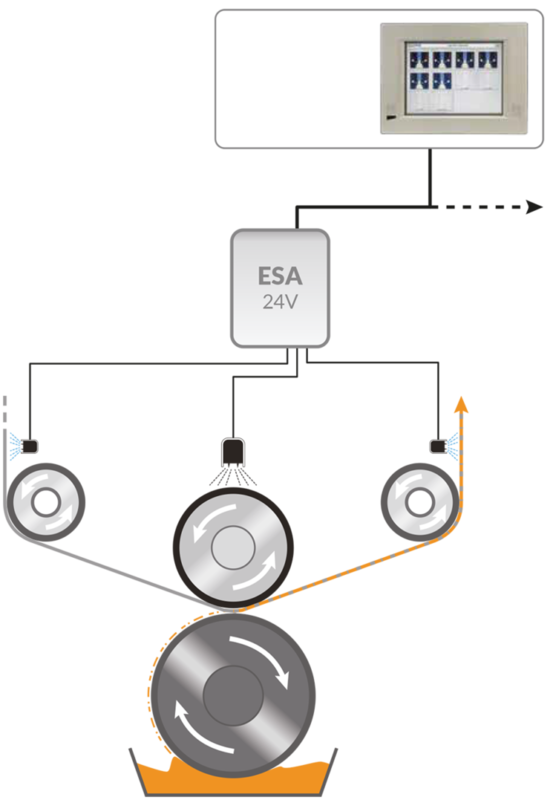 The use of dual polarity of the londual BB bar offers the advantage of completely eliminating the static charges on the substrate before entering and immediately after leaving the printing unit, so as to ensure total ESA system efficiency as well as to grant maximum work safety conditions. The structure of the londual BB bar, sturdy and robust, is designed and built to resist to the action of ink and solvents and has been designed to allow its cleaning in a simple and fast way. The new DE-R24 bar, patented and with low voltage 24V technology, installed on top of the pressure roller, creates a homogeneous and intense electric field on the semi-conductive layer of the sleeve. The generated electric field thus ensures the necessary polarization of the ink contained in the engraved cells that can thus be completely transferred to the substrate to be printed. 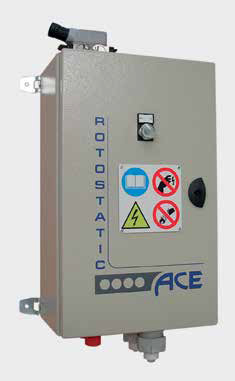 Thanks to the 24V ACE technology, the safety within the printing unit is now at the highest levels thanks to the elimination of high-voltage cables used in the past to connect the static and anti-static bars, which if damaged, were a source of electrical discharges and potential triggers of fire inside the printing element. The substrate is made neutral at the entrance of the printing element thanks to the antistatic londual BB 24V bar. Contemporarily the sleeve of the pressure roller is influenced by the correct electrostatic charge through an efficient and safe 24V charging bar located just above the pressure roller. This 24V charging bar generates an intense and homogeneous electric field (ACE Total Charge 24V Technology) that polarizes the ink allowing its easy and complete transfer to the substrate. At the exit of the printing unit a second antistatic londual BB 24V bar eliminates every residual charges from the substrate.